Roxadustat (Ai Rui Zhuo® in China) is an orally administered, small molecule hypoxia-inducible factor (HIF) prolyl hydroxylase inhibitor that is being developed by FibroGen, in collaboration with Astellas and AstraZeneca, for the treatment of anaemia in patients with dialysis-dependent chronic kidney disease (CKD), non-dialysis-dependent CKD and in patients with myelodysplastic syndromes. The drug reversibly binds to and inhibits HIF-prolyl hydroxylase enzymes that are responsible for the degradation of transcription factors in the HIF family under normal oxygen conditions. Inhibition of these enzymes reduces HIF breakdown and promotes HIF activity, leading to an increase in endogenous erythropoietin production, thereby enhancing erythropoiesis. It also reduces the expression of the peptide hormone hepcidin, improves iron availability and increases haemoglobin levels. HIF regulates the expression of genes in response to reduced oxygen levels, including genes required for erythropoiesis and iron metabolism. Roxadustat is approved in China and is under regulatory review in Japan for the treatment of anaemia in patients with dialysis-dependent CKD. Studies are underway to investigate long-term cardiovascular outcomes with roxadustat versus placebo (for non-dialysis-dependent CKD) or standard of care (for dialysis-dependent CKD). This article summarizes the milestones in the development of roxadustat leading to this first approval. During the peer review process the manufacturer of the agent under review was offered an opportunity to comment on the article. Changes resulting from any comments received were made by the authors on the basis of scientific completeness and accuracy. Sohita Dhillon is a salaried employee of Adis/Springer, is responsible for the article content and declares no relevant conflicts of interest. FibroGen. FibroGen announces approval of roxadustat in China for the treatment of anemia in chronic kidney disease patients on dialysis [media release]. 17 Dec 2018. http://investor.fibrogen.com/phoenix.zhtml?c=253783&p=irol-newsArticle&ID=2380952. FibroGen. FibroGen enters agreement with Yamanouchi to license erythropoietic small molecule in development for the treatment of anemia [media release]. 24 Sep 2004. http://investor.fibrogen.com/phoenix.zhtml?c=253783&p=irol-newsArticle&ID=1984318. FibroGen. FibroGen licenses oral HIF-PH inhibitors, including FG-2216 and FG-4592, to Astellas for the treatment of anemia in Europe and other regions; FibroGen positioned to develop first oral anemia therapy for North America [media release]. 28 Apr 2006. http://investor.fibrogen.com/phoenix.zhtml?c=253783&p=irol-newsArticle&ID=1984254. FibroGen. FibroGen announces initiation of phase 2b studies of FG-4592, an oral HIF prolyl hydroxylase inhibitor, for treatment of anemia in chronic kidney disease [media release]. 17 Mar 2011. http://investor.fibrogen.com/phoenix.zhtml?c=253783&p=irol-newsArticle&ID=1983440. AstraZeneca. AstraZeneca and FibroGen collaborate to develop and commercialize FG-4592, a treatment for anemia in chronic kidney disease and end-stage renal disease [media release]. 31 Jul 2013. https://www.astrazeneca.com/media-centre/press-releases/2013/astrazeneca-fibrogen-fg4592-anaemia-treatment-chronic-kidney-disease-renal-disease-31072013.html#. FibroGen. FibroGen announces receipt of $62 million license payment from AstraZeneca [media release]. 8 Jul 2016. http://investor.fibrogen.com/phoenix.zhtml?c=253783&p=irol-newsArticle&ID=2182906. FibroGen. FibroGen announces receipt of $120 million license payment from AstraZeneca [media release]. 29 Jun 2015. http://investor.fibrogen.com/phoenix.zhtml?c=253783&p=irol-newsArticle&ID=2063398. FibroGen. FibroGen’s roxadustat (FG-4592) meets primary endpoints in two phase 3 anemia studies in China [media release]. 30 Jan 2017. http://investor.fibrogen.com/phoenix.zhtml?c=253783&p=irol-newsArticle&ID=2240513. FibroGen Inc. SEC Filings: form 10-K. 2018. http://phx.corporate-ir.net/phoenix.zhtml?c=253783&p=irol-SECText&TEXT=aHR0cDovL2FwaS50ZW5rd2l6YXJkLmNvbS9maWxpbmcueG1sP2lwYWdlPTEyMDg4MDE4JkRTRVE9MCZTRVE9MCZTUURFU0M9U0VDVElPTl9FTlRJUkUmc3Vic2lkPTU3. Accessed 2018. Shibata T, Nomura Y, Takada A, et al. 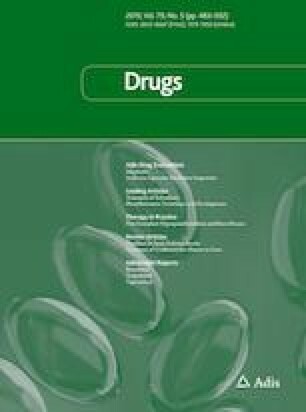 Evaluation of food and spherical carbon adsorbent effects on the pharmacokinetics of roxadustat in healthy nonelderly adult male Japanese subjects. Clin Pharmacol Drug Dev. 2018. https://doi.org/10.1002/cpdd.597. Groenendaal-van de Meent D, den Adel M, van Dijk J, et al. Effect of multiple doses of omeprazole on the pharmacokinetics, safety, and tolerability of roxadustat in healthy subjects. Eur J Drug Metab Pharmacokinet. 2018. https://doi.org/10.1007/s13318-018-0480-z. FibroGen. FibroGen announces positive topline results from three global phase 3 trials of roxadustat for treatment of anemia in patients with chronic kidney disease: primary efficacy endpoints met in all three studies, non-dialysis, incident dialysis, and stable dialysis studies [media release]. 20 Dec 2018. http://investor.fibrogen.com/phoenix.zhtml?c=253783&p=irol-newsArticle_print&ID=2381297. AstraZeneca. Phase III OLYMPUS and ROCKIES trials for roxadustat met their primary endpoints in chronic kidney disease patients with anaemia [media release]. 2018. https://www.astrazeneca.com/media-centre/press-releases/2018/phase-iii-olympus-and-rockies-trials-for-roxadustat-met-their-primary-endpoints-in-chronic-kidney-disease-patients-with-anaemia20122018.html. Astellas Pharma. Astellas announces positive topline results for global phase 3 trial of roxadustat in chronic kidney disease (CKD) patients with anemia not on dialysis [media release]. 20 Sep 2018. https://www.astellas.com/system/files/news/2018-09/180920_eg.pdf.